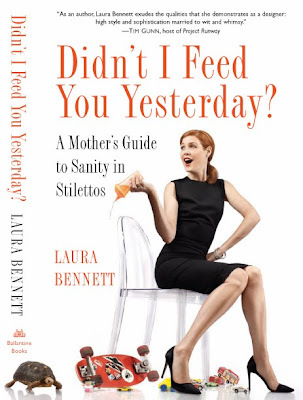 In reviewing Laura Bennett's new Book, Didn't I feed you Yesterday? I was given an opportunity to do a little Q& A with her. I didn’t feel surrounded by kids, I actually felt like a kid myself. The producers told us when to sew, eat, and sleep. They brought our food to us and took us where we needed to go; like fashion-designing toddlers. But motherhood did give me some advantages in the competition. We slept only three or four hours a night, which was no problem for me because I haven’t slept in ten years. I was also prepared to handle the unexpected, because raising kids throws you a curve at every turn. 2. How do you handle the pressure to be a superwomen, or an example of superwomen. Pressure to be the super stylish designer from Project Runway, the perfect wife, mom, etc...does one of those present more pressure to you than the others, do you find one aspect the hardest to deal with or do you pretty much just focus on being the perfect YOU and tell everyone else (and their expectations) to shove it? I have a huge wall unit made from twelve Ikea bookshelves bolted together, filled with baskets and bins. That is the space they get for toys. If it fits, you can have it. If not, you had better make room by throwing something out. As the boys get bigger, toys are becoming less of a problem but sporting goods are taking over my life. 4. so the question I know many people are thinking (because we all currently have young boys). POTTY TRAINING, I mean potty training 5 boys alone should make you famous :-) Did you do it or did your "girls" (I call everyone girls too!) and do you (or them) have any tips? And with 5 boys do you dream of the day when you can have your very own bathroom all to yourself? I think their preschools probably did the most to get them potty trained. They would line up all the kids at designated times during the day and have them sit on the potty. That being said, I wouldn’t qualify this group as potty trained. They still jump out of the car on weekends when we get to the country and pee in the yard like it’s their god given right. As far as tips, I would say relax. I have yet to have a child that didn’t eventually learn to read or pee on the toilet seat. It doesn’t really matter at what age they do it. 5.I realize the idea that you are a bad mommy because you take time for you and a career was not a self imposed moniker but one that was given to you. Do you think that stems from moms wishing they could do that? I know I often wish I had help if for no other reason than to have floors that aren't crumb covered and sticky. I would rather spend my free time doing things with my kids that cleaning the floor. I’m not sure how some people equate having help with being a sub-par mother. I have no doubt that it makes me a better mother. By the way, my boys are on spring break this week and I have been with them all week by myself. My floor is disgustingly sticky. I keep thinking if I don’t clean it, someone will show up and do it. 6. Answering the "6 kids! How do you do it?" by saying you have help isn't that putting yourself down a little bit, debunking that myth of a supermom/women? Because really your girls aren't there when a kids gets sick in the middle of the night and she's not breastfeeding your baby...it may not have been funny but wouldn't it have been more honest to say it's juggling, and hard but I love it and I have help? I am lucky to have help but that certainly doesn’t make me a hands-off mom. We usually coordinate who goes where and who does what each day. I generally have as much, or more, kid related stuff to do as they do. The main thing having help does for me is, I don’t have to take all the kids with me where ever I go. It’s the moving about as one big group that’s killer. 7. "I have the luxury of accepting them as they are, quirks, disabilities, genetic mutations and all" (page 10) Why do you think this is the case for mom of multiple children? Is it because chaos rules our houses so we are by nature more laid back? Or is it the pressure of society? I think when you have several kids you learn that they are who they are. You may think you are forming who the first one is but you soon realize that to a certain extent, they arrive with their personalities in tact. I’ve learned just to go with that. I do get a bit nervous if the house is too quiet. Not that I suspect they are doing anything wrong, just that their chaos is like my white noise. I am just accustomed to it. Their room is not that bad. Probably because they don’t really play in there, that is where they go to read and sleep. They tend to play out in the open space. 9. Who feeds the pets? I won't get anymore because I already have too many mouths to feed. I say I already have too many living things to take care of. I feed all the pets, so I get to decide which pets we have. I will never fall for the, “I swear I’ll take care of it“ line. Never. 10. on pg 188 you talk about how moms do everything when it comes to Christmas and the Holidays ...this is so true my husband does nothing for any holidays and his is excuse is I do it better. however he is still good at celebrating me...he just often leaves out the kids, does your husband get the kids involved in celebrating you (birthday's mother's day) and how? There was an episode this season of Patty Heaton’s new show, The Middle. Her husband took over Christmas, at the end he admitted it was too hard and he couldn’t handle it. It was perfect. For the last couple of years we have just kind of played chicken to see who is going to start. Then it’s usually the gay manny, Blake, to the rescue. He will start the boys to stringing popcorn and cranberries. To read more about the book and Laura Bennett, please click over here for the rest of my Fab Friday post. * The link above (if you click the image of the book) is an affiliated link that will take you to Amazon to purchase the book, if you purchase the book through that link I will get 4cents, to you know save up for that toothpick I need. It is so AMAZING that you got to do this interview! I absolutely ADORED Laura on her season of Project Runway. You forgot to ask her the most important question: will she PLEASE come give me a frumpy-to-fabulous mom makeover? From one mom with a pack of boys to another? Are you listening Bravo/style network? What a great show that would be!